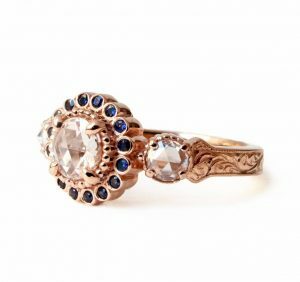 As one of the winners of the Centurion 2018 Emerging Designer Competition, Toronto designer Shelly Purdy will exhibit at Centurion Scottsdale later this month, sharing her Vintage Opulence Collection with a U.S. audience. Canadian designer Shelly Purdy is among the winners named for the Centurion 2018 Emerging Designer Competition. The award honours exceptional independent jewellery designers who have never exhibited at a U.S. fine jewellery trade show. Purdy will join other winners Wolfgang Vaatz (Rio Rico, Ariz.) and Tara Hutchinson (San Antonio, Tex.) in claiming free exhibit space at the Centurion Scottsdale show January 28 to 30. Each winner will also receive a $1000 merchandise credit from Stuller, the contest’s sponsor. The three were chosen by the Centurion Retailer Advisory Board from a list of 17 finalists, as narrowed down by a panel of judges including Maren Rosen (Stuller’s vice president of merchandising), Monica Stephenson (blogger for iDazzle), and Marion Fasel (jewellery author and historian). Purdy, a trained goldsmith, is the only Canadian on this year’s list of winners. Based in Toronto, she opened her boutique jewellery studio in the city’s fashion district in 1991. Her designs reflect her passion for both her craft and the industry, with much of her work comprising highly personal, bespoke pieces made with Canadian diamonds.